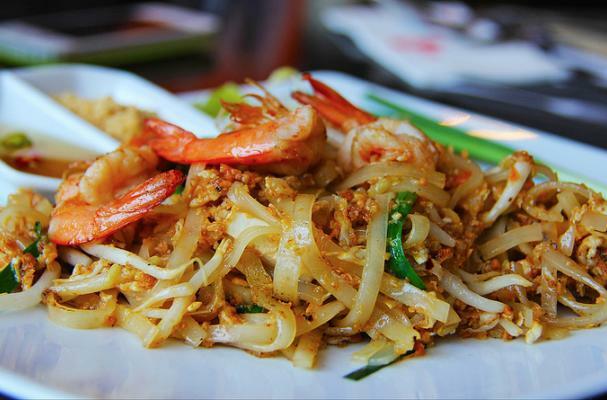 Pad thai (or phad thai) is a typical street food of Thailand and a ubiquitous dish on Thai-American menus as well. This authentic pad thai recipe (made gluten-free) comes from the Chiang Mai Cookery School located in the Northern mountainous part of Thailand. Pad thai is a delicious stir-fry that requires little more than chopping and stirring, but the key is in the sauce. This side of Asia the dish is often made too sweet but instead, it should be a balance of sweet and sour with just the right amount of delicious funk (and salt) from fish sauce and an appropriate quantity of chile pepper - the latter of which is, of course, according to taste or whether or not you're serving those of a tender age. Buy good shrimp, preferably wild and on the larger side and leave the tails on for a nice presentation. Be sure to not overcook them, just a few minutes in the wok until they just turn pink. They finish cooking in the final stir-frying once all the ingredients come together as one. Garnish your final dish with crushed peanuts, freshly chopped cilantro, and wedges of lime. Heat oil in a wok over medium-high heat and fry the garlic, carrots, chili peppers, and tofu until the garlic turns golden brown. Add the shrimp and continue to stir-fry until the shrimp begin to turn pink (take care to not overcook the shrimp). Transfer to a plate and set aside. Add the softened rice noodles and chicken stock and stir-fry over high heat. Continue stirring until the noodles are softened. Reduce heat to medium and add half of the sauce; stir until well combined. Move noodles to one side of the wok and add the beaten eggs; scramble until thoroughly cooked then stir into the noodles. Add more sauce to adjust taste if necessary. Add 3 tablespoons of the peanuts, the green onions, and bean sprouts; stir-fry until combined. Transfer to a serving dish and garnish with the remaining chopped peanuts, fresh cilantro, and lime wedges.